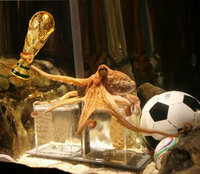 Lots in the news lately about Paul the Octopus and his correct prediction of 8 World Cup match results. He has his own Facebook page http://tiny.cc/pt96e , he’s got a Widipedia entry http://tiny.cc/zagcd and of course an iPhone app. According to the Sea Life Centre in Oberhausen, Germany, Paul has officially retired from his prognostications, but the endorsement deals are just beginning for this famous cephalopod. Enjoy the video and song!